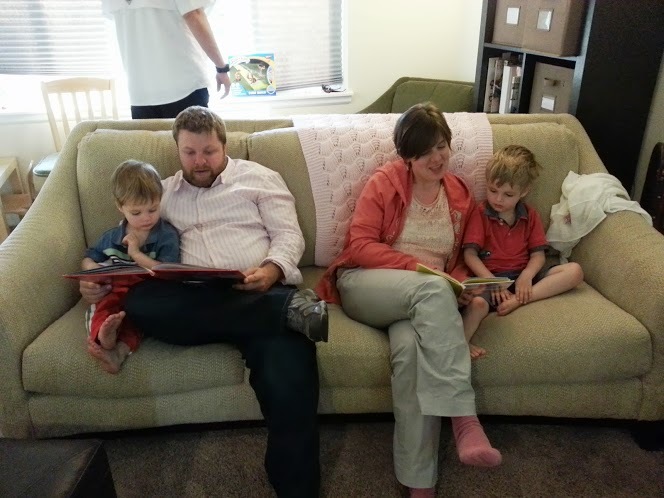 Last weekend we hosted a family gathering to celebrate Joel’s birthday and Father’s Day. We lucked out with perfect weather. It was sunny but not too hot which meant we got to make great use of our backyard and everyone was able to gather around some great food and have time talking with each other. 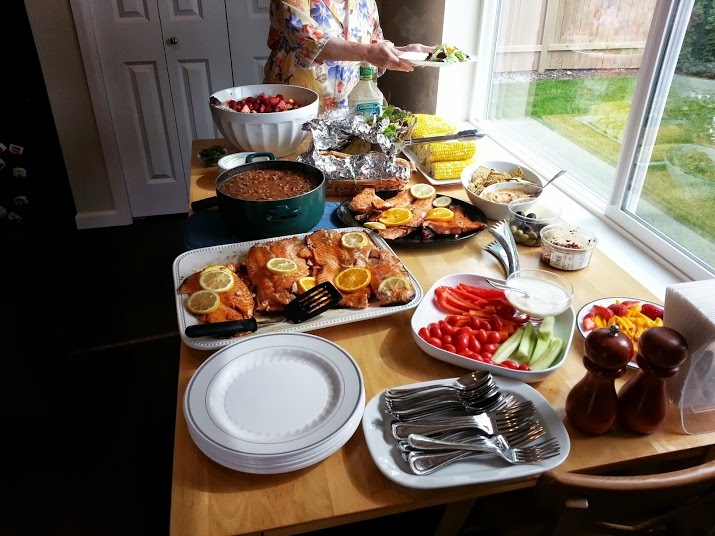 Our “simple little dinner”, potluck and family style ready to eat! Grandma brought a homemade carrot cake to use for the birthday boy’s candle blowing ceremony. The boys got to help frost the cake. And stick all the candles in the cake. The boys kept putting the candles in wick first so it took a little bit of work to get everything cleaned up, in the cake the right direction and ready for the big blow. Some of the relaxing going on in the back yard. Happy Birthday was sung and the boys helped blow out the candles. Once the party was underway I pretty much sat back and let all the other moms and aunties take care of everything. Pregnancy does have some perks! 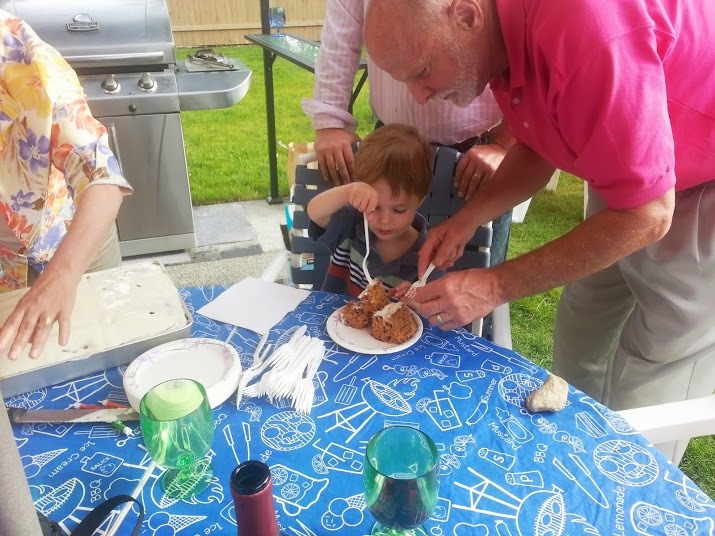 Here’s Papa sharing a little bit of cake with Miles. Joel’s Aunt Teresa brought her camera and captured some great pictures of the gathering. Graham and Miles gave Daddy hand painted works of art he can hang in his office at work. Mr. Graham being goofy after too much chocolate sauce. The Aunties brought the boys duck hats! And eventually we got around to the family picture taking. Four generations of Davis men in celebration of Father’s Day. Mr. Miles cheesing it up! And a great shot with Uncle Matt added to the group. Then a picture of the Davis four with MY Daddy too. (some of) The Davis women! Later in the evening after the majority of family had gone home, Uncle Matt and Aunt Suzanne stayed and helped us with the boys’ bed routine. A bunch of books were enjoyed. It was neat to see them all together, it had been too long!